Thursday March 17th 1881 I was busy about the work and my sewing all day. We looked for Kate Pentzer this morning but she did not come. We all went to the law society in the evening to hear the boys of the house sing. Kate came tonight. 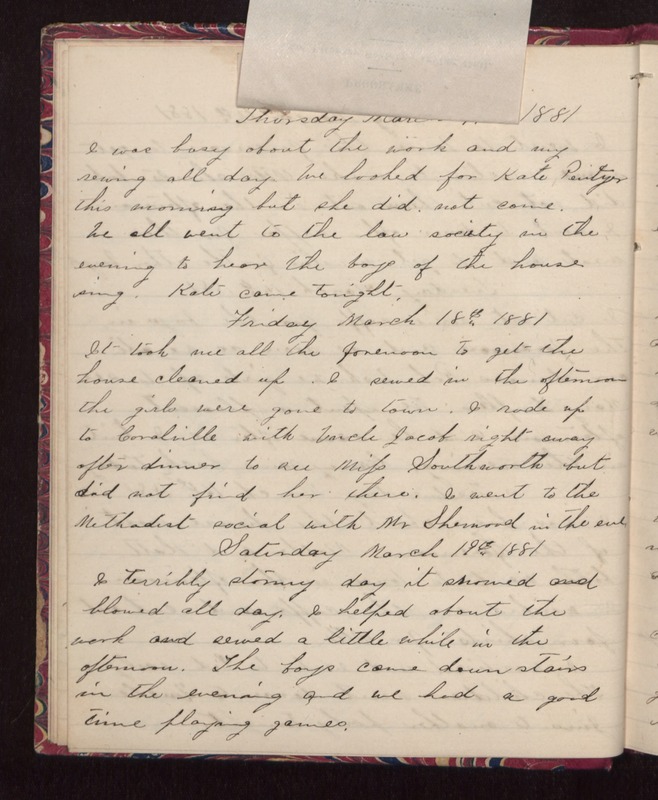 Friday March 18th 1881 It took me all the forenoon to get the house cleaned up. I sewed in the afternoon, the girls were gone to town. I rode up to Coralville with Uncle Jacob right away after dinner to see Miss Southworth but did not find her there. I went to the Methodist social with Mr Sherwood in the eve. Saturday March 19th 1881 Is terribly stormy day it snowed and blowed all day. I helped about the work and sewed a little while in the afternoon. The boys came down stairs in the evening and we had a good time playing games.